Just as we need to understand the impact of tourism, construction, or the fishing industry on our economy and society, we need to understand the significant role that nonprofits play in our state. 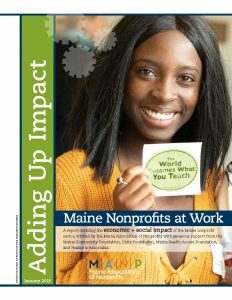 MANP conducts regular research on Maine’s nonprofit sector to help organizations, individuals and policymakers better understand the vital role of nonprofits in creating, sustaining and improving Maine’s quality of life. Our nonprofit impact reports include data on the size and scope of the sector as well as profiles of diverse Maine nonprofits providing excellent return on society’s investment. Learn more about Maine’s nonprofit sector, and help us spread the word about why nonprofits matter. Post your nonprofit’s stories of impact on Facebook and Twitter using hashtag #NonprofitsWorkForME. Find graphics and templates in our Frames That Work toolkit! Host a presentation at your annual meeting or conference! Learn more about having MANP come speak in your area. Together we can ensure nonprofits continue to work for Maine. Note: These reports provide a snapshot rather than trend analysis. Data sets have varied some from year-to year.